Wallace Sims Bransford was born on 6 December 1894 in Arkansas. He married Helen Lee Bouldin, daughter of James Edward Bouldin II and Catharine (? ), on 9 October 1922 in Lonoke County, Arkansas. At the time of their marriage Helen's residence was Austin, Texas.. The following appeared on 17 December 1942 in the Tucson Daily Citizen: Pima County Treasurer Wallace Bransford has collected $448,019.03 in taxes for the state for the first half of the present fiscal year. These are exclusive of the collections made for Pima county. . . . Payments were described as exceptionally good. The include some amounts due on levies made prior to the present fiscal year, however. Helen Lee Bouldin became a widow at his death. Wallace Sims Bransford died on 9 July 1948 at age 53. He was interred at Evergreen Memorial Park, Tucson, Pima County, Arkansas. 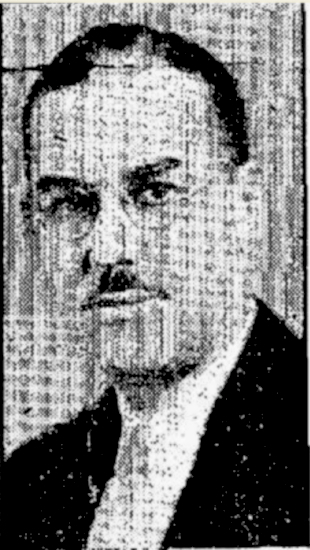 The following appeared on 10 July 1948 in the Tucson Daily Citizen: Rites for Wallace Sims Bransford, 53, former Pima county treasurer and auditor for the Arizona industrial commissio who died Friday afternoon, are ste for 4 p. m. Monday at the First Baptist church. . . Surviving are his wife, Mrs. Helen Bouldin Bransford, East Third street; a daughter, Mrs. Mary Martin, of Phoenix; and two grandchildren. The following appeared on 9 July 1948 in the Tucson Daily Citizen: Wallace Bransford, former county treasurer and one-time exalted ruler of the Eliks lodge here, died suddenly of heart disease about 1:30 p.m. at the industrial commission office, 57 East Jackson street. Jack Stille said that Bransford, employed as an auditor by the commission for the past two years, came back from lunch and complained he was not feeling well. A physician arrived at the office and administered oxygen, but Mr. Bransford was unable to respond to treatment. Mr. Bransford was county tresurer just before the term of County Treasurer A. B. Cole, immediately following the term in the office of now Acting Gov. Dan Garvey. After serving as chief deputy, Mr. Bransford was elected treasurer for two terms and served from 1939 to 1943. "The death of Mr. Bransford is a loss to the industrial commission," Stille asserted. "He was valuable to our office as an auditor." Mr. Bransford resided at the corner of North Warren avenue and East Third streed. Born in Lonoke, Ark., Dec. 6, 1894, Mr. Bransford has lived in Tuscon since 1918. Surviving are his wife, Mrs. Helen Bransford, a married daughter who lives in Phoenix, and two grandchildren.